One of the pictures that's 'winding up' Carragher. JAMIE CARRAGHER AND Gary Neville spent a lot of time on Monday Night Football praising Arsenal for the tactical nous shown in their impressive 2-0 win over Manchester City on Sunday. Carragher in particular was quite complimentary about the Gunner’s defensive strength and willingness to move away from the tactics that have failed them in recent games against top four opposition. However, he also took time to criticize Arsenal players for almost immediately taking to social media in the wake of the win, declaring the recent trend in ‘celfies’ – celebratory selfies – to be ‘nonsense’. “It’s something that is winding me up in football. This nonsense of team pictures and social media after games in the dressing room. You normally have this stuff with a cup. “You see this everywhere, it’s not just Arsenal. It’s absolute nonsense, stop doing it. 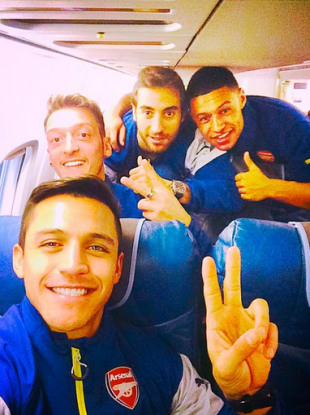 Email “Jamie Carragher is not at all happy with Arsenal's post game selfie 'nonsense' ”. Feedback on “Jamie Carragher is not at all happy with Arsenal's post game selfie 'nonsense' ”.